When memories of stone fruit are fading as summer moves into autumn, plums give solace. It is only the last year or two that I have rediscovered my love for plums. 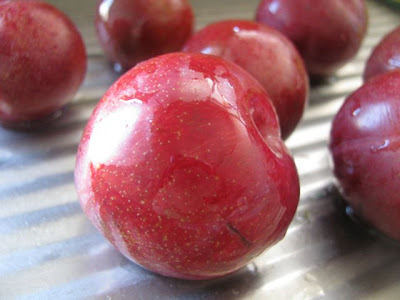 An occasional bag of plums in my shopping has provided delicious fresh fruit and the motivation to use them in cooking. As part of my love affair with plums I have delved into their history. 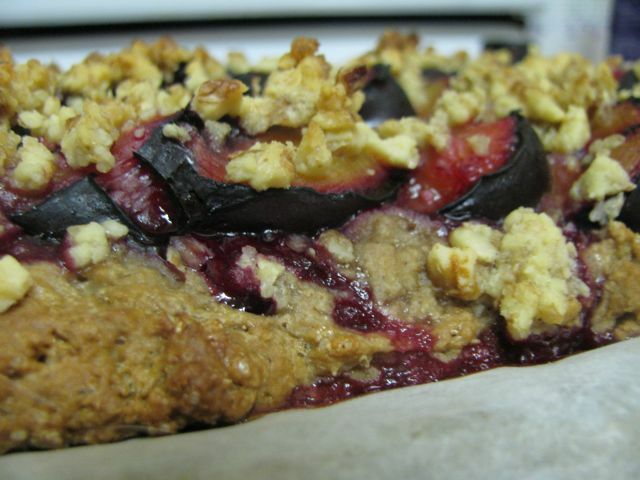 It has taken me so long to write it up that plums are now out of season but my enthusiasm for the fruit and the cake at the end of this post is not dinted. What do plums mean to me? When I think of plums, I find they are part of my childhood. I think of our abundance of cherry plums from the tree in the backyard of my childhood home, the pleasure of tart blood plums in season, the daintiness of sugar plum fairies in the Nutcracker ballet and the Night Before Christmas, of Little Jack Horner pulling a plum out of his pie, of Professor Plum in Cluedo. If someone spoke posh they had a plum in their mouth. More recently I have found that you can buy Plum baby wear in Australia and there is a Plum organic baby food label in the UK. The lovely piece of fruit has given us far more depth of meaning to the word plum. “Plum” is also used to describe a glorious deep shade of purple. It can also mean something of the superior or desirable kind such a plum job. 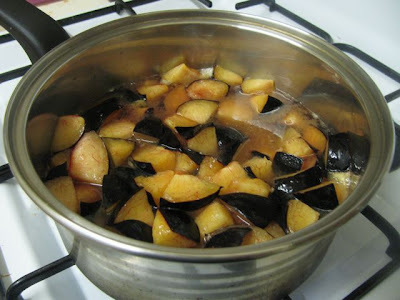 Most frustratingly when I have searched for information about plum is the wealth of information about plum puddings. This was often a mystery to me as a child but I did find an explanation. The Oxford dictionary tells us that “in 1660, Plum used to mean "a dried grape or raisin such as used for puddings, cakes, etc". Plum pudding never had fresh plums in it, but another explanation is that it had dried plums or prunes. We also have the delightfully named plum duff, plum jalousie and plum shuttle – the latter are both sweet plum plastry dishes – that Jane Grigson writes about. Wild plum trees were harvested in ancient times. It is unknown when plums were domesticated but we do know that the thorns were bred out. The Damson plum is believed to be the oldest plum variety. I have read that it was named for its place of origin, Damascus, that it was grown in ancient Mesopotamia, and that it is even thought by some to have been grown in the Hanging Gardens of Babylon. Pompey the Great began cultivating plums in his gardens in Rome in 65 BC and the Crusaders brought back plums from Syria to Europe. Plum stones were found on the wreck of Henry VII’s flagship, the Mary Rose, which sank in 1545. I was fascinated to read that plum stones are unique to a particular variety, like human fingerprints, and these stones were traced back to the plum varieties in when the wreck was raised in the 1980s. One of my favourite places for food history is the Old Foodie. She has some lovely mentions of plums in the past. A “Marmalet of any tender plum” comes from The Queen’s Closet* Opened: Incomparable Secrets in Physick, Chyrugery, Preserving, Candying, and Cookery; As They Were Presented to the Queen By the Most Experienced Persons of our times … by W.M (‘one of her late Servants), 1658. Amelia Simmons (‘an orphan’) published a book in 1798 called American Cookery, or the art of dressing viands, fish, poultry, and vegetables, and the best modes of making pastes, puffs, pies, tarts, puddings, custards, and preserves, and all kinds of cakes, from the imperial plum to plain cake: Adapted to this country, and all grades of life. Plums have been eaten many ways in history. It is claimed that the prune (dried plum) was a staple food of the Tartars, Mongols, Turks, and Huns. There is also a record of a Cheshire retailer in 1524 stocking “nutmeg plums” among the preserved plums in his apothecarial stock. More recently, in the 1870s, Manet painted The Plum, a painting of a prostitute leaning on a bar with a plum in brandy in front of her. Apparently, plums in brandy were all the rage in Paris at the time. How can I not think of her? But home is far away." So wrote Confucious who included plums in his list of popular foods. Plums are believed to symbolise wisdom and good fortune in China. 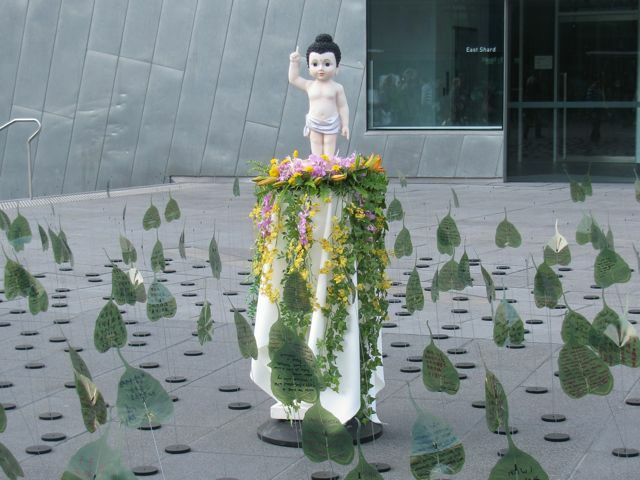 Hence it was seen to be lucky that Lao-Tse, the Chinese philosopher who was purported to be the founder of Taoism in the 6th Century BC, was born under a plum tree. Plums also feature in 14th Century historical novel, Legends of the Three Kingdoms. Plum blossoms represent courage and hope in Chinese new year. They burst forth at the end of winter on a seemingly lifeless branch. In Chinese art, plum blossoms are associated with the entire season of winter and not just the New Year. 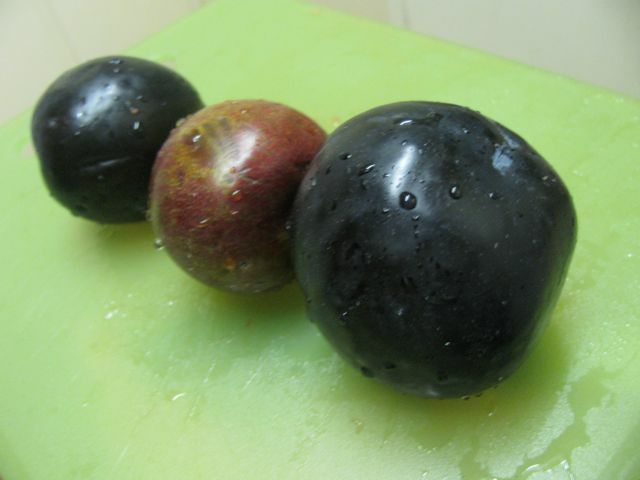 Stephanie Alexander, in The Cook’s Companion, comments that the plums discussed by Jane Grigson are not the ones that are common in Australia. We don’t have damsons, sloes and mirabelles that might be found in Europe. (Don’t expect damson jam and sloe gin on this blog!) 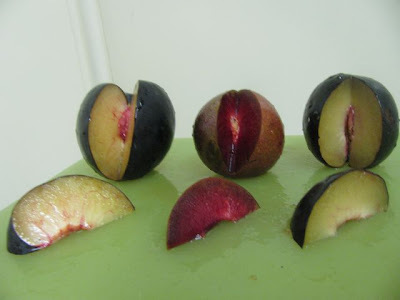 There are two main types of plums: European and Japanese. However I have been overwhelmed by the variety of plums in the information I have read about them. Many countries have their own distinct variety. Stephanie also writes that plum trees used to be common in Australian backyards. That would explain our old cherry plum tree. Cherry plums are quite small with red skins and a soft yellow flesh. Our cherry plum tree was so abundant that the fruit would turn to mush underfoot in that corner. My mum stewed them and served them with ice cream. We would play tinker, tailor, soldier, sailor with the stones. We also had a blood plum tree with larger plums that had deep red skin and firm deep red tart flesh. But this tree was a little more reluctant to bear fruit. Australia also has a native bush plum that is found in the Northern parts. Also known as the Kakadu plum, it was a seasonal staple of the local Aboriginal people’s diets and is very high in Vitamin C. These days it is being hailed as a 21st century superfood. The Japanese plum came from China in the 16th Century and seems to have spread around the world but a distinctive Japanese flavour is the plum or “ume”. From this word we have the processed umeboshi, a sour pickled plum and umeshu, a sweet alcoholic beverage made of plums. The Pilgrim Fathers brought Euopean plums to the New World. 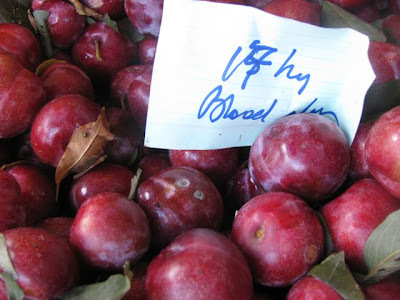 America's most famous pomologist, Luther Burbank, not only wrote about plum history but also claimed his import of 12 plum seedlings in 1885 was the single most important fruit importation in American history (and he wasn’t biased, was he!) He successfully bred Japanese plums. Before colonisation, there was the Native American plum that still grows in most USA states and in Canada. Traditionally, Native Americans used many parts of the trees. The Cheyenne ate the fruit (plums), and used branches for the Sun Dance. The Navajo used the roots to make red dye. This is a poem called This is Just to Say by William Carlos Williams. I came across it in the Man Who Ate Everything, in which Jeffrey Steingarten nominates it as his favourite plum poem. I have to agree with him. Though I have not found many plum poems of any significance, the fruit is an evocative reference for poets. Ben Jonson in To Penshurst wrote “The earely Cherry, with the later Plum, Fig, Grape, and Quince, each in his time doth come:” Keats wrote ode to a nightingale under a plum tree and praised the sweetness of plums in a poem called On Fame (II) with the lovely line “and the ripe plum still wears its dim attire”. He inspired Sylvia Plath as a student to write “Ode to a Bitten Plum”. Plums appear in a few of Christina Rossetti’s poems, including a nonsense poem called A City Plum and the line " "Have done with sorrow; / I'll bring you plums to-morrow / Fresh on their mother twigs" from the wonderfully fruity poem, The Goblin Market. 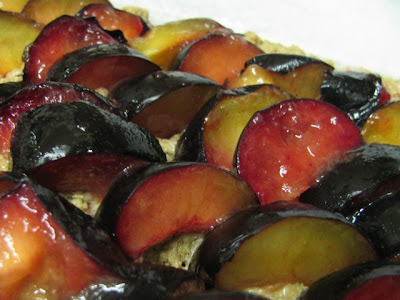 Although not many plum poems abound, I have found interesting uses of Plum in literature. Janet Evanovich has a detective called Stephanie Plum in her murder mysteries. PG Wodehouse was called Plum by family and friends. Herta Mueller, who won the 2009 Nobel Prize for Literature, wrote a novel (that I once saw her read from at the Irish Writer’s Festival) called the Land of Green Plums. I even found some children’s books with plum in the title: Stories to eat with a blood plum by Australian Jackie French, Janet and Allan Ahlberg wrote Each Peach Pear Plum (one of Sylvia’s favourites) and Laura Ingalls Wilder wrote On the Banks of Plum Creek. It was my plum chutney last year that renewed my plum enthusiasm. This year I was really pleased to finally make the cake that I hadn’t managed to make last year. I was out of milk and wanted to use up flours so I had to adapt the recipe I’d seen on Tofu for Two. I made it one night in late January, listening to Herman’s Hermits singing “I’m Henry the Eighth, I Am”, playing on the radio, while E was getting our new set top box set up (so we can watch digital tv) and Sylvia slept. The cake was a little dry on the edges but the was moist in the middle and the plums on top were still slightly tart but soft and jammy. 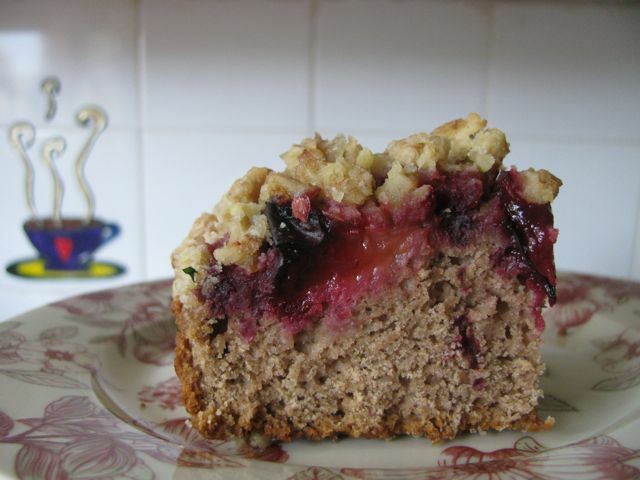 The cake was significant because not only was it the first plum cake I have made but also Sylvia’s first taste of cake. 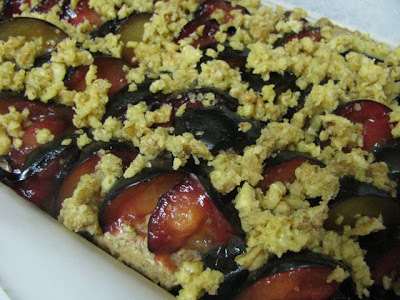 Unfortunately, this is not a history lesson on plum kuchen. I can't even get the name right. If you want to read more about them, you could check out Seitan is My Motor's discussion about the related linguistics on her Pflaumenkuchen post and Cooking the Books investigation of her family recipe for pflaumekuchen. 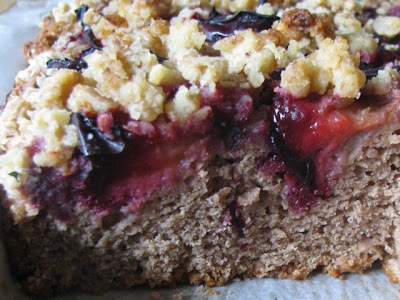 But if you want real food for thought, check out this Plum Cake essay by John Weir about Nazi Germany circular logic which which compares Hitler's order for the extermination of the Jews to Alice in Wonderland's plum cake that Alice had to distribute before she could cut it. With all this information, it is just right for Weekend Herb Blogging (#235), a weekly event where bloggers showcase ways to use different herbs, spices, fruit and vegetables. I am sending this cake to Haalo of Cook Almost Anything who is hosting this week, as well as the WHB Guru and Coordinator. She took over from Kalyn who founded the event. Dissolve yeast in warm water. Set aside. Combine flours, cinnamon, sugar, baking powder and salt. Stir in soy milk, juices, margarine, and yeast mixture. Spoon batter into a small slice tray - my batter was very stiff - maybe could have done with slightly more liquid as it was on the dry side when it came out of the oven. Arrange plums over the batter. 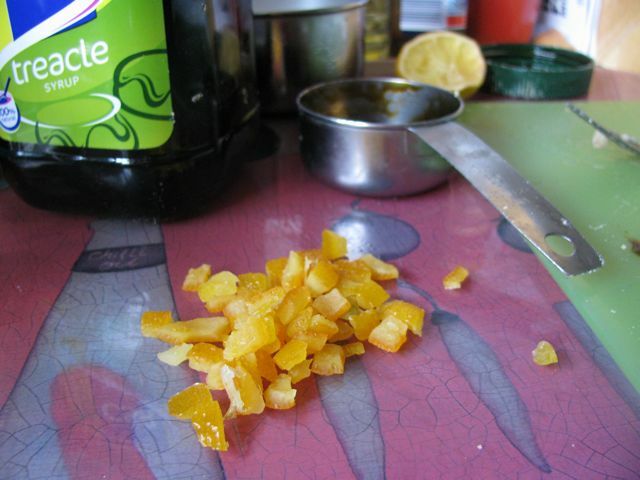 To make the topping, rub margarine into the remaining ingredients in a small bowl. Sprinkle over the plums. Bake at 190 C for 30-70 minutes (Vegelicious says 30-40 minutes, Tofu for Two did 30-40 minutes at 200 C, I did 70 minutes at 190 C. Take your pick!) It is ready when a skewer inserted in the middle comes out clean, the topping is crisp and the plums are soft. Serve warm or room temperature. It keeps for a few days. I had thought that I would get this post up last night but life is always unpredictable. Instead I did my first samurai sudoku that I have done for months. It used to be one of the weekend pleasures to sit down and complete the samurai sudoku from the weekend newspaper but these days I barely have time to glance at it. The only reason I felt compelled to complete it last night was that I had been in the car with Sylvia and instead of her sleeping on the journey, she went to sleep 5 minutes before I arrived at the shopping centre. I had my sudoku with me and spent an hour doing it while she slept in the car. 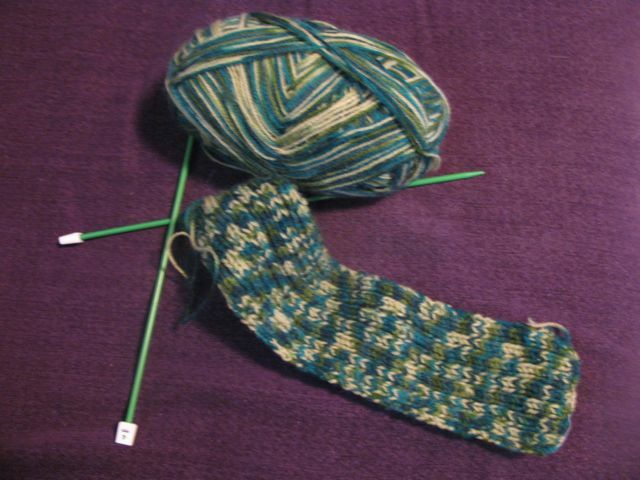 So I finished it last night while watching Masterchef, instead of blogging and knitting as I had planned. Speaking of which, I couldn't believe it when I was looking at the toys yesterday and found that there is now junior Masterchef kitchen equipment packs for kids. I was also amused when I heard that E had shared the last leg of his flight home with Gary Mehigan, one of the Masterchef judges. E joked that he had overheard Gary chiding the air steward about plating up his breakfast. 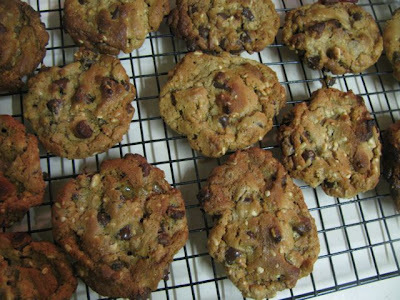 Seriously though, I had intended to make E some of his favourite choc chip cookies but I was tempted into unknown waters by Cakelaw's GF Peanut Butter and Choc Chip Cookies. I was intrigued by the cup of peanut butter in the mixture where you might usually find butter and flour. When I told my mum she thought it was outrageous - we have to agree to differ on this. I believe you can never have enough peanut butter. 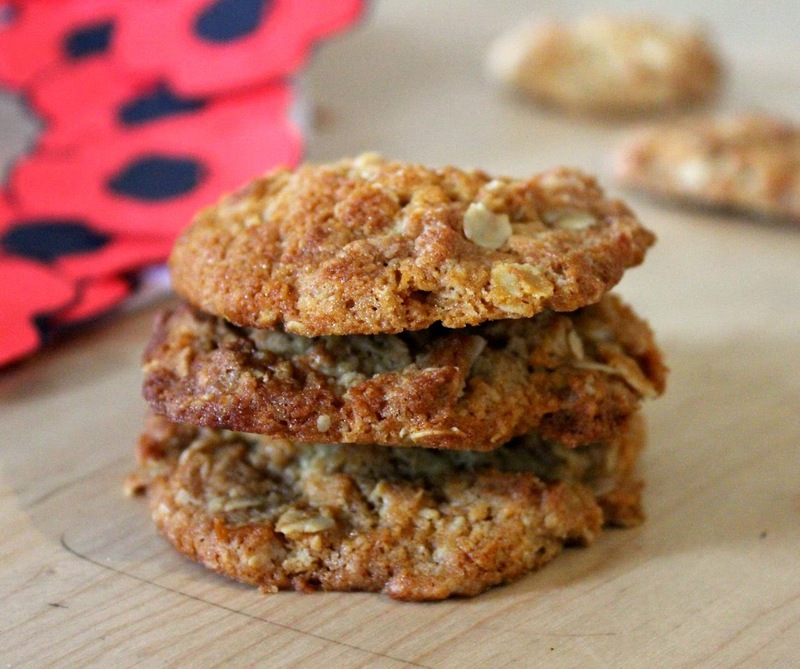 These cookies were light and buttery with a slight chewy texture. What I loved about these cookies is that they are easy and accessible. You would never guess they were flourless. It seems that the crunchy bits of peanut are the main clues to the peanut butter in them. I am curious to try baking them with smooth peanut butter. The ingredients are easy to find in most pantries or any supermarket. But the downside is that they would not be welcome at many children's parties, schools or child care centres due to the nut content. 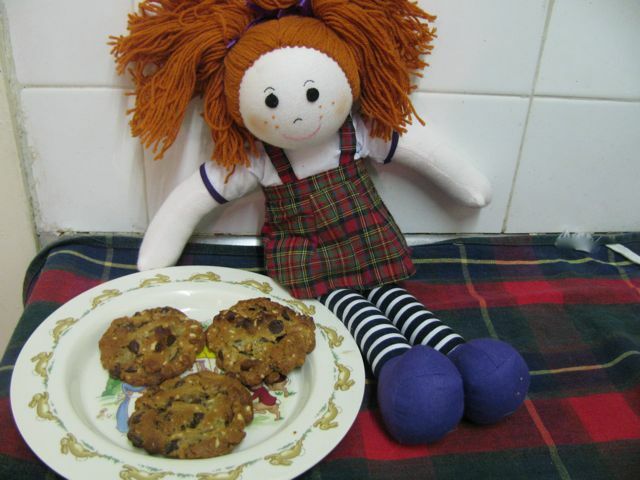 In fact, Sylvia has not even tried them because she is too young for peanut butter or chocolate (and she is quite happy with gingerbread). However I think Sylvia's new doll would quite fancy a taste. (You can see her in the top photo.) She was a present from a family friend and came back from Scotland in E's suitcase. Gorgeous, isn't she? Preheat oven to 200°C. Grease and line two baking trays. Combine peanut butter, sugar, bicarbonate of soda and egg in a mixing bowl. Stir in choc bits. Roll teaspoonfuls of the mixture into balls and press lightly with a fork or do as I did and drop teaspoonfuls on the prepared trays. 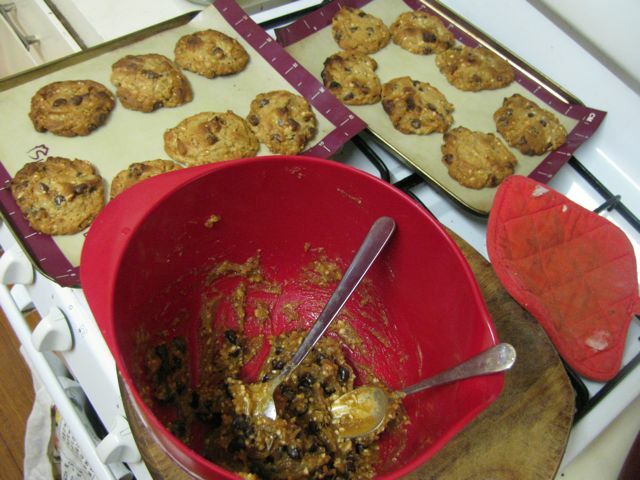 I did as Cakelaw wisely suggested and left plenty of room between cookies because they spread a lot. Bake for 8-10 minutes or until light golden. Leave to cool on the trays for at least 10 minutes or until cool. Store in an airtight container. It has been busy here lately so I was quite pleased to finally get on top of my growing list of unread posts in my blog reader (I confess I partly managed this by accidentally selecting a large amount of unread posts and making them read). This means I that I have been able to catch up with neglected blogs, including Nupur's One Hot Stove. While reading about her latest post this morning (a lovely Strawberry Cake), I found that she is hosting an event for bloggers to post about a recipe they have adapted from another blog. It appealed to me because rarely do I follow a recipe to the letter. 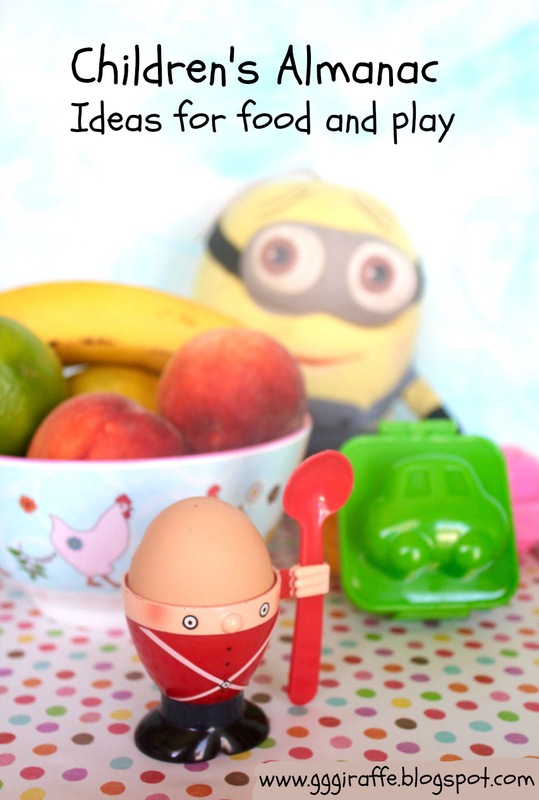 The event closes today so I found a recipe I have been meaning to post that fits the bill. 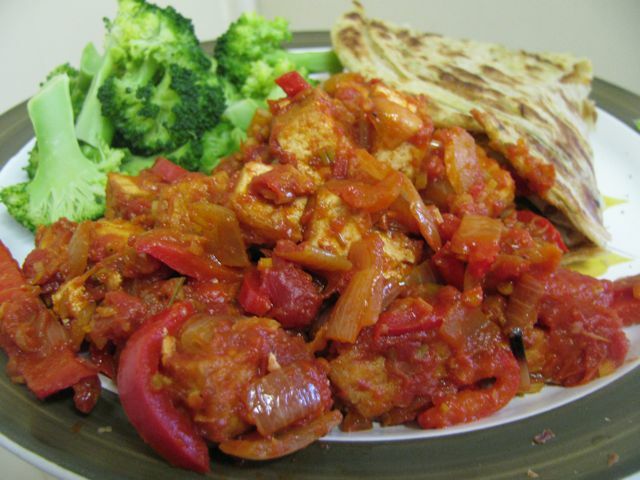 The Tofu with a moreish tomato and ginger sauce dish came from Sophie at Mostly Eating. 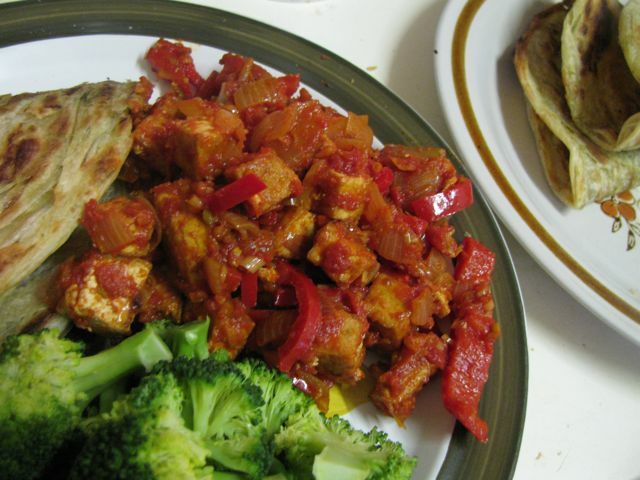 I was particularly interested in the recipe because it used lemongrass and molasses, neither of which I would usually pair with tofu in this way. Looking at my notes about the ingredients I used and my photos, I remembered that I had made quite a few changes. Firstly I had halved the recipe because I didn't have enough tofu. I didn't have fresh chillis so I used cayenne pepper instead and I added some red papper because I wanted to use it up. I also decided to change the method and cook the tofu in the sauce rather than frying it and adding it at the end. My logic was that I like tofu to absorb as much flavour as possible. The tofu was lovely, though it seemed to have a bit less sauce than Sophie's. Maybe my tofu absorbed more of it. The flavours were delicious. We ate it with broccoli and roti but I would like to try it with rice or even rice noodles for a gluten free alternative. So with my blog reader temporarily under control I have a new project (though I have so much tidying around the house that needs to be done as well as a scarf to finish knitting for Sylvia). I have tired of having so many recipes bookmarked that I never return to or can find when I need them. 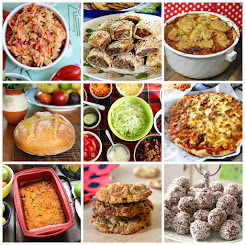 My new project is to try and start bookmarking recipes on Delicious so that I can search my bookmarks by ingredients. I usually avoid signing up to more sites that will take up more time, but I am hoping this one will help me organise myself a bit more efficiently. Press tofu between two plates, wrapped in a piece of kitchen towel (or a clean tea towel) with a heavy weight on top. Leave for at least 10 minutes while you prepare the other ingredients. Heat 1 tablespoon of oil in a large frypan over a medium heat and fry onions for about 5 minutes. While onions are cooking, chop the tofu into chunks. Add the red pepper and fry for another few minutes til it is softened. Remove onion/red pepper mixture and set aside, Add 1 extra tablespoon and the tofu to the frypan and cook for about 10 minutes until the tofu is lightly browned. Return onions and red pepper to the tofu, add lemongrass, cayenne and garlic. Cook a few minutes, stirring frequently, til fragrant. Add tomatoes, molasses, soy sauce and ginger juice. Simmer for about 10 minutes until liquid thickens slightly. Serve with a squeeze of lime juice (if you remember). Sylvia and I headed to the airport on Saturday morning to greet E with big smiles and take him home. I was very pleased to have brownies and gingerbread to offer him but had been itching to try some new bread I had seen on Munchkin Mail last week. 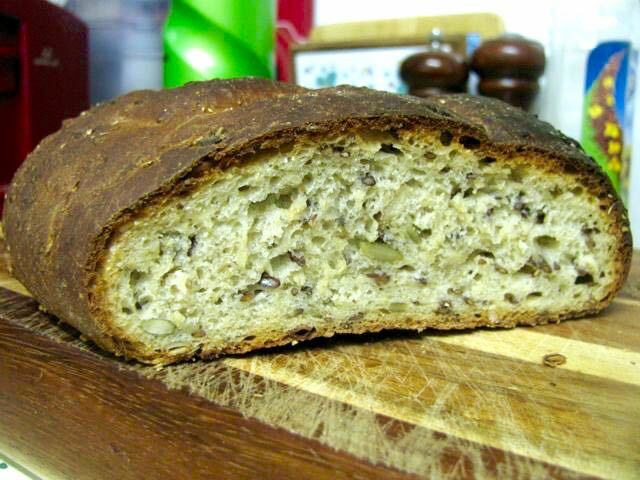 It promised to be very easy but, more importantly, I have been looking for a good multigrain bread recipe and was won over by the interesting mix of grains. Dan Lepard calls it the easiest loaf in the world and I would quibble with this, having found out how easy Jim Lahey's no-knead bread is but semantics aside, this is a most excellent recipe. (As an aside, I have recently being gently rebuked at work for being too literal with the truth in newsletter articles so one might claim that Dan was just in search of a good headline.) 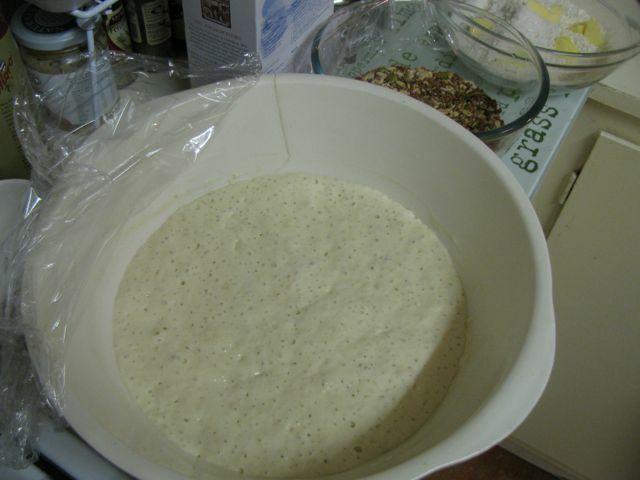 In fact, the two recipes have some similarities in that they are both more interesting in letting the dough sit for a reasonable length of time to let the dough develop slowly rather than pounding it like a punching bag. Not much stress relief but excellent bread! Dan does suggest in his basic techniques advice that the kneading is a token gesture and it is the time it sits and the interactions between the ingredients that makes more of a difference. I was interested to read him say that if you reduce the salt, the bread will rise faster. I sometimes do this because I find that some bread recipes have too much salt for my liking. Like the no-knead bread, this recipe is forgiving of busy lifestyles. Rather than having to attend to my dough, I was able to leave it and watch E unpack his case to produce all manner of cute clothes for Sylvia, cookery magazines/books for me, and momentos of his recently departed mother. I was also able to leave the dough and go shopping by myself, a rare treat when I have been the sole carer of an active toddler for the past couple of weeks. I have written up notes on how I made the bread and you will see I didn't always read the recipe too closely. When you hear that I put the dough in the oven while trying to wash the dishes, help E get Sylvia to sleep, and watch telly, I hope you will understand why. After reading Jim Lahey's advice that bread straight out of the oven is still baking and should cool before it is cut, I had the patience to wait for about an hour before cutting myself a slice. By then E and Sylvia were sound asleep. I ate it warm with butter and marvelled at how good it tasted. The dark crust that I had worried I had burnt was soft and full of flavour. The middle was slightly sweet and full of interesting textures. There are other variations at the webpage where I found the article so I will be back for more. The loaf was eagerly sliced through on Sunday. E loved it with a bit of cheese. So did Sylvia and I but it needed something else. I had some pesto in the fridge and blitzed a few spoonfuls with a tin of cannelini beans and a squeeze of lemon juice to make a lovely dip that all of us enjoyed. This dip was excellent in a sandwich with roasted pumpkin and brussells sprouts today, though I am still envious of Lysy's working lunch she made with this bread accompanied by salad, cheese, pickles and hummus. So much nicer than the soggy sandwiches caters often deliver to our working lunches. This is a bread I would welcome at any lunch, a bread I will make again, a bread I am proud to share. 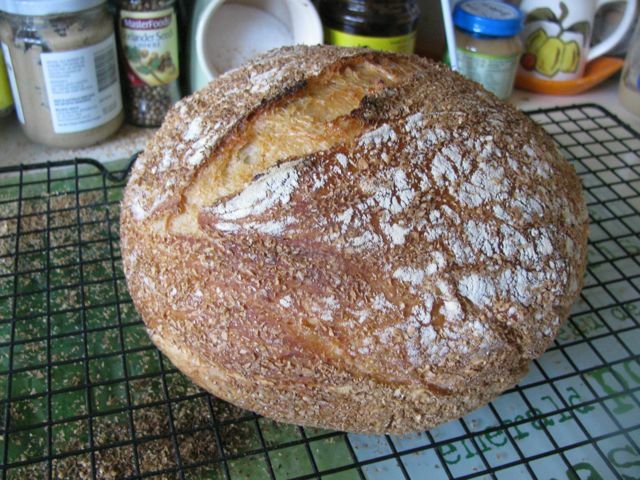 I am sending it to Susan of Wild Yeast for her weekly round up of yeast baking on the blogs at Yeastspotting. 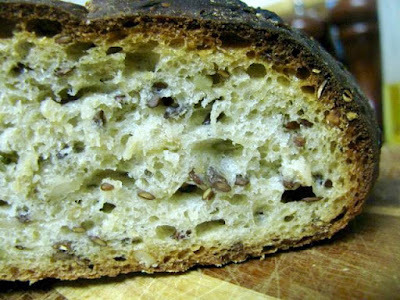 I have just noticed that there is a search field for YeastSpotting - there are always such fantastic breads here and now you can search them so I recommend you check them out if you are interested in baking bread. This time three years ago: Where have all the vegetarian salads gone? First mix the flour, lukewarm water and yeast to make the sponge. Dan says to scald a big mixing bowl but I forgot. He said to cover and leave for 2-4 hours or overnight. I left mine 6 hours because I was busy but I was glad I waited because after 2 hours it looks fairly similar but after 6 hours the sponge was nice and bubbly which I am sure made a difference. While the sponge is rising, prepare the grains by mixing all the ingredients (oats, grains, honey and water) together in a small bowl. Leave to cool. When the sponge is ready mix in the soaked and cooled grains. Then rub butter into the remaining flours and salt in a medium bowl, and stir into the sponge. Mine was quite stiff. Cover and leave in the bowl for 10 minutes. Then knead lightly on a well floured board (for about 1 minutes) 3 times at 10 minute intervals. NB I used a lightly floured board but I now have read Dan’s basic techniques notes where he says that he just uses a lightly oiled board to knead to avoid having to add more flour (which changes the moisture content) and he only kneads for 8-10 seconds. Dan then advises to lightly flour the bench, roll out the dough, roll it up and put it in a 2lb loaf tin but I just made it into a log and put is on a baking tray. I greased the tray and then scattered some wheat germ on it. 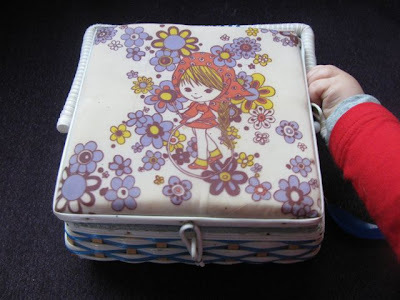 (But I might try my loaf tin next time). 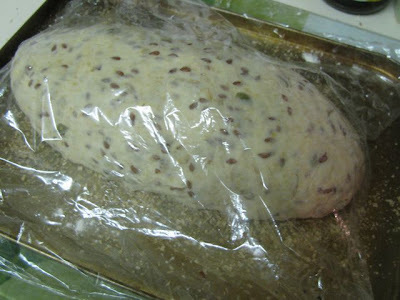 Cover and leave in a warm place for about 1½ hours until the dough doubles in size. I placed clingwrap on it and it stuck so next time maybe I need to grease the plastic or flour the dough. Dan says to slash with a razor or serrated knife – I tried but am unfamiliar with the technique and slashed and then scattered with wheat germ rather than the other way and as a result found my slashes full of wheat germ. Heat the oven to at least 220C – 240 C and steam if you like. Dan talks about steaming in his notes but I hadn’t read these and just did a half-hearted squirt of water into my oven which probably didn’t do much. I cooked it for 20 minutes at 240 C and found it was very dark coloured. So when the recipe instructed to bake at 200 C for the next 20 minutes I put mine on the middle of my oven. I also cooked it upside down for another 5-10 minutes to make sure the bottom was brown enough. Keeps for 2-3 days. Last Christmas I received an excellent cookbook from my sister in law (HH) called Scottish Home Baking by Judy Patterson. I have searched high and low for a book of traditional Scottish recipes and never found anything else as good. When recently baking some gingerbread with mixed peel from this book I began to ponder how our grandmothers cooked, the myths and the reality. Let me tell you about the gingerbread first. It was wonderful, being both soft and spicy in a mild and inoffensive way. I did wonder if I should have left it for the texture and flavours to deepen over time but it was pleasant enough to eat fresh. However, when I gave a few pieces to E to take to work, they were forgotten for a few days and he liked them much more when he rediscovered them. What first piqued my interest about the recipe was that it had dried mixed peel in it. Not many recipes do these days. I used to hate mixed peel as a child, never being a huge fan of all things citrus, but now I have come around to appreciating it. However I noticed that while it can be found in dried fruit mixes, it is not easy to find by itself in shops any more. So that got me wondering why. Here is my hypothesis – once upon a time, our grandmothers couldn’t buy an orange for love or money and all they could get was dried mixed peel but today recipes often call for fresh orange or lemon zest because it is so easy for us to buy. Maybe I am wrong but it did make me think about how much we take for granted these days. We don’t have to wait for fruit and veg to be in season, we don’t have to wait for our hens to lay eggs, or to deal with a glut of zucchinis from the garden. Even in Scotland, where in E’s childhood fruits such as watermelon were rare and exotic, you can find many fruit and veg these days. Thinking along these lines made me interested in an excellent recent article on Nutrition Unplugged questioning the pithy advice Michael Pollan writes in his books. I love the way he writes (and have written about Michael Pollan previously but I did start to think about the assumptions underlying his suggestion that we should not eat any anything that our grandmothers would not recognize as food. The assumption is that our grandmothers were wholesome and healthy, eating only the food produced by the land. The assumption is that they would be horrified to see what we are eating today because they loved baking bread every day and collecting eggs from the chookhouse every day. The assumption is that they were right and we were wrong. But let’s think about their lives. Our grandmothers had hard lives. We only have to look at some of our processed foods to understand this. Take for example one of my favourites: condensed milk. I love it because it is sticky and gooey. Our grandmothers loved it because sometimes it was the only way they could get any sort of milk. I have always loved my mum’s tomato sauce and was surprised to learn that the secret ingredient is Wild’s Ezy Sauce. This is a spicy liquid flavouring. More recently I fell in love with my grandmother’s tomato chutney and found it had the same ingredient. I love using my own blend of spices for chutney but it is easy to buy a whole range of spices these days and I only make chutney when I choose. However if I had to make chutney to deal with the tomato glut, or because we had to be frugal to make ends meet, or because we had to make do with whatever was available, then I might welcome any help I could get. Ezy sauce has become part of my heritage now and one day I might find myself using it because the taste is a comfort to me and reminds me of the food of my foremothers. When Pollan talks about not eating food our grandmothers wouldn’t have recognized, it suggests they had nothing to do with overprocessed foods and our lack of connection with the source of food. In fact many of our grandmothers would have been delighted at the new world opened up to them by processed foods and bright shiny supermarkets. Of course there were other forces at work – industrialization, the entry of women into the workforce, colonization etc. But when I think about it, I think that maybe our grandmothers would recognize and welcome more of our foods than Pollan suggests. His advice is a warm and pleasant sentiment but it ignores the reality of how and why our food culture has changed. But all this discussion is not to forget that our grandmothers knew how to make do far better than we do these days. I live only 5 minutes walk from three supermarkets that are open long hours as well as many small fruit and veg shops and middle eastern food stores. I am spoilt. So I always feel a little pleased with myself when I am able to make do. Having a small child about makes it a little harder to rush out to buy what I need. On the day that I made the gingerbread, I discovered that although I had mixed peel, I did not have eggs or buttermilk. 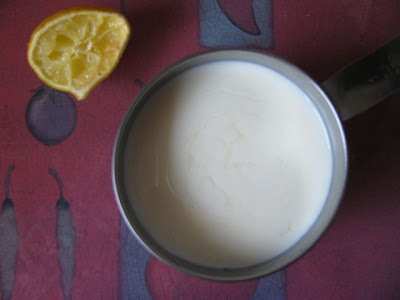 Milk with a splash of lemon juice could be substituted for buttermilk and bananas were substituted for eggs. Ironically, it is not from my grandmothers that I have learnt these skills of substitution but rather from the blogging community. Nevertheless I like the idea that history is cyclical rather than linear and that my foremothers might approve of such resourcefulness. This time three years ago: Choc Chip Cookies go Bananas! Preheat oven to 180 C. Grease and line a lamington tin. Place all dry ingredients except the peel into a large mixing bowl and rub the butter in. Stir in the peel. 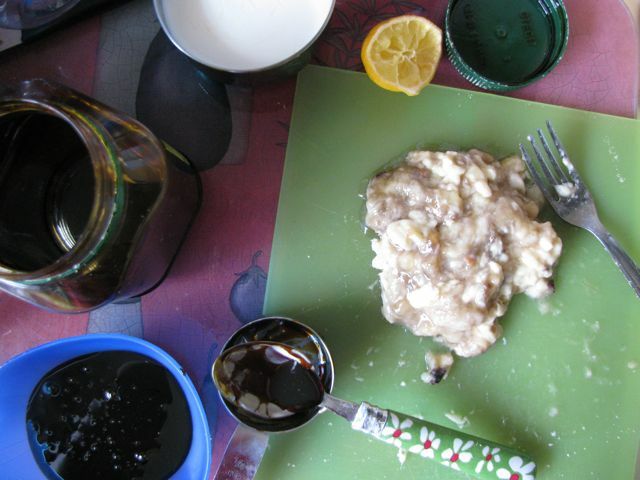 Warm the treacle gently (I did this in microwave) and mix in the eggs (or banana). Add to the dry ingredients. Stir in the buttermilk. Bake 30-40 minutes. Cool and cut into squares. I liked them fresh but E preferred them forgotten about in his desk for a few days. Yesterday I wrote a long post on the woes of my week. Today I give you a short one praising St Nigel for his comfort food. Where yesterday’s post was vegan and healthy, tonight’s is indulgently decadent. I have resisted chocolate too long and I needed some last night. 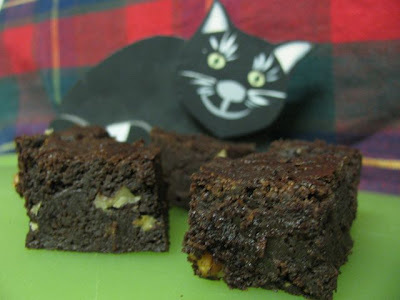 I am constantly in search of brownie recipes to try and consulted my cookbooks in search of inspiration. I wanted a recipe with lots of chocolate and not too many eggs. 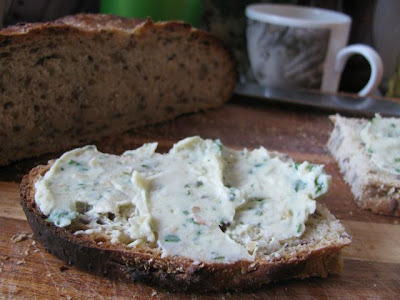 This recipe from Nigel Slater’s Kitchen Diaries convinced me I should try more of his recipes. It is superb. 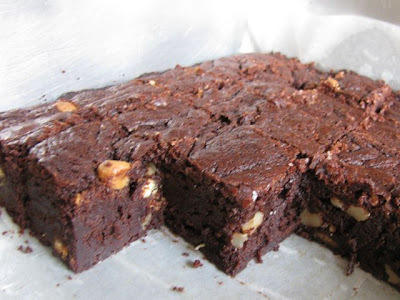 Fudgy, dense, moist and rich. I simplified his method somewhat. Electric beaters, multiple bowls, extra egg yolks and sifting weren’t for me. Sometimes I strayed too far, misreading golden castor sugar as raw sugar and stirring in white chocolate chips when the mixture was too hot. When will I learn! 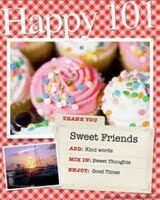 Yet the brownies were wonderful. I like to think they would have St Nigel's blessing. Preheat oven to 180 C. Grease and line a 23cm square cake tin. Melt butter and 200g dark chocolate together in microwave. Add sugar, then eggs, then flour and cocoa, then chopped chocolate and walnuts, stirring after each addition. The mixture should be thick and glossy. Pour into prepared cake tin and bake for 30-45 minutes until a skewer inserted into the middle of the brownie comes out with sticky mixture on it but not gooey uncooked cake mix. Leave another few minutes. Remove from oven and cool in tin. Cut into small squares as it is very rich. 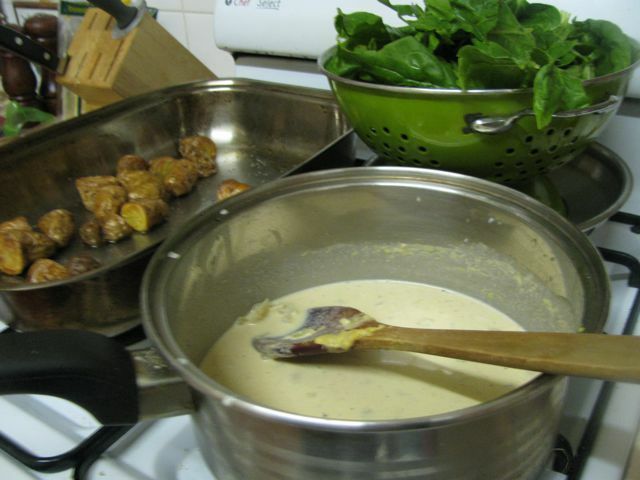 Over the past week or so I have been experimenting with spinach and vegan cheeze sauce. 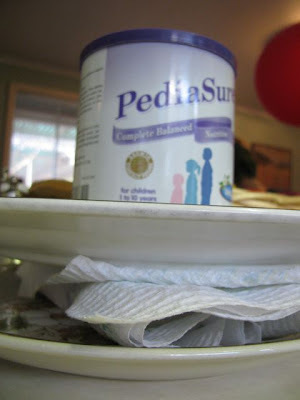 So this post goes from vibrant sauce to creamy soup, from market to high chair, with musing about the mysteries of nutritional yeast flakes, whinging about a lost wallet and all the while I am constantly having sylvia climbing over me! Yes that is my life right now. But where to start? Perhaps first of all I should tell you that my quest for a spinach cheezy sauce started with Ricki and Kim's Savoury or Sweet Kitchen Challenge, which focuses on spinach this month. I tried to find spinach at the Collingwood Children's Farm Farmer's Market about a week ago but there was none to be found, making me wonder if it was out of season. No spinach but l had lots of ideas. 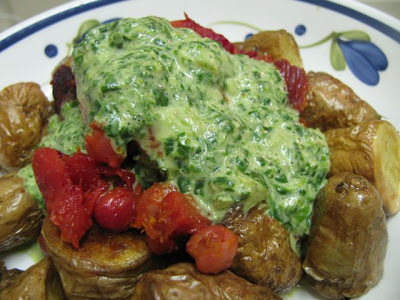 I had seen Scrumptious of In My Box post a photo of an amazing Tofu Florentine (broiled marinated tofu over garlicky chard and roasted root vegetables, topped with Cheezy sauce). 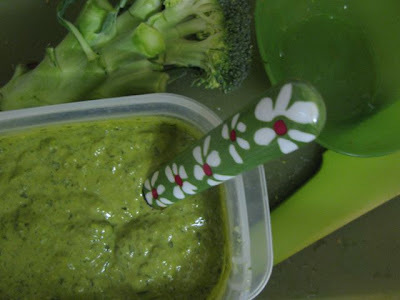 I couldn't find a recipe and then I thought what if I blended spinach with the cheeze sauce! 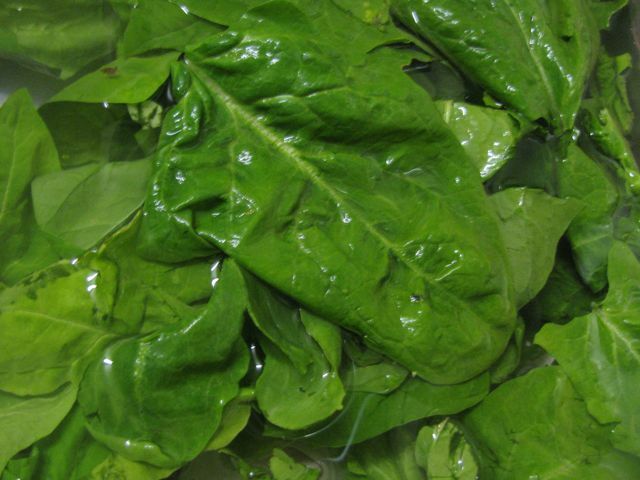 I love the idea of spinach being a nutrient packed food dye. Upon getting home after the farmer's market I tried a marinated tofu. It is something I used to do a lot and have fallen out of the habit and wish it hadn't been before I started blogging because I don't have any record of what I did. 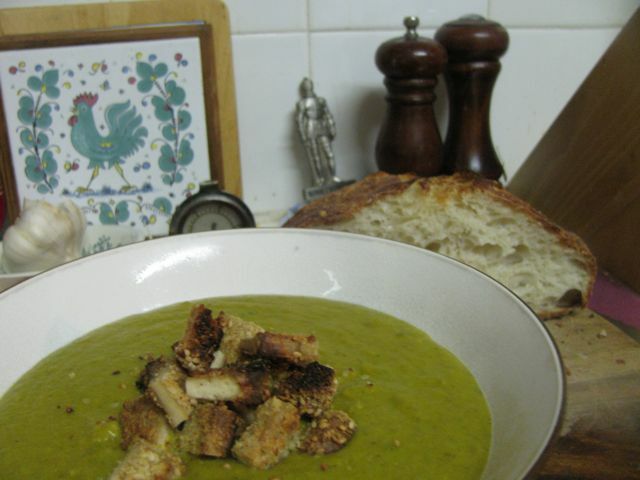 What I did have was some GF toasted maize that I had bought on a whim and seemed a good way to crumb the tofu. The first lot I did I just dipped in the marinade without soaking and they were a bit bland. So the other half of the tofu sat in the marinade for about an hour and it was delicious when crumbed and baked. Even Sylvia loved the little chunks of tofu. The next week I was at a meeting near the Queen Vic Market so at lunchtime I bought spinach and tofu in preparation to make the dish in my head a reality. I felt confident in marinating and preparing the tofu after my test run. However the final tofu was not so good because I bought an unfamiliar brand which was so firm that it did not soak up the marinade. D'oh! So the final dinner looked pretty (though not as pretty as Scrumptious's photo) but it was lacking. The tofu at the centre of the meal was crunchy but tasteless. The spinach sauce was not quite right.. However it tasted good with the slightly sweet, lightly salted roasted pumpkin, beetroot and fennel. And the sauce was a wonderful vibrant green. The highlight of the meal was probably my loaf of no-knead bread that accompanied the tofu, veg and sauce. At least this worked because not much else has. On Sunday Sylvia and I took the train to the city to go to the Buddha's Day and Multicultural Festival. I wanted to check out the vegetarian stalls but it wasn't meant to be. Perhaps it was a sign I shouldn't have gone that E was and my friend who was going to go with us was sick. Instead I had the disappointment of passing the stalls without tasting one mouthful because I discovered that my wallet had disappeared upon arriving at Federation Square. I couldn't even purchase a leaf for the above Bodhi Field of Enlightenment. Given that I achieved no enlightenment on Sunday, I will pause for a whinge. Firstly I fell into temptation when I spied the first edition of the Masterchef Australia magazine. Though it has some good recipes, it annoyed me with a spotlight on blogs that included the line about the Daring Bakers Challenge being about vying to be the best. I took umbrage at the idea that blogging is all about competition with each other rather than embracing a community of cooks who share lots of ideas and encouragement. 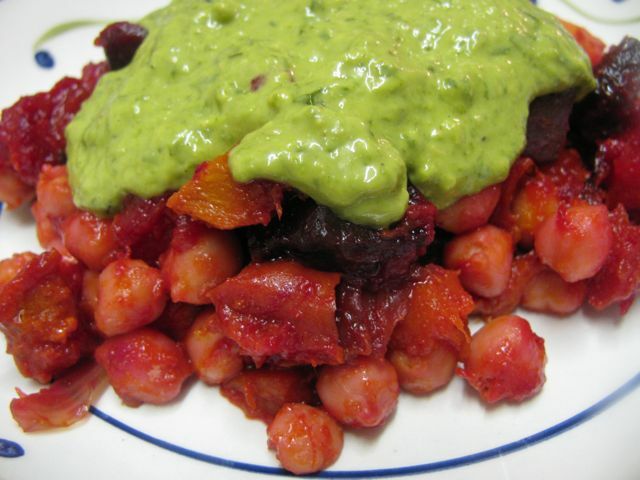 That night I ditched the tofu and tried the dish again with chickpeas, roasted veg and cheezy spinach sauce. It was ok but the sauce still wasn't quite right. I was so disappointed with it that I decided to try again. This time I used much less nutritional yeast flakes and more seasoning. The taste was much better but I was disappointed that I didn't have the lovely creamy texture that I had enjoyed in the first sauce. Was it because I had less nooch or because I waited til the spinach was cooked before blending. This again is where I wish I understood the nooch better. I don't have time for more experimentation so will present this work-in-progress recipe as I enjoyed the flavours. It wasn't quite perfect because the garlic wasn't cooked enough, I forgot the lemon juice, and the sauce was a little pasty from the cornflour. So I have changed these on my recipe below. In the future I would like to try this again with some other vegan cheeze sauces. I would like to try the one from Vegan Brunch that Cindy and Michael loved. I also liked the idea of Maple Spice in creating a vegan cheezy spinach pasta sauce. I have tried a few other cheeze sauces before. They have been good but not great so I still hope to find the ones with the 'wow' factor, but I guess I have to stop comparing them to dairy cheese sauces. I also served the sauce with roasted pink fir apple potatoes because I needed some extra comfort in my dinner on Monday. You can probably guess that it was no fun chasing my lost wallet. I was lucky enough that someone handed it in but then I spent the day trying to contact lost property who were constantly engaged and when they weren't they had no record of it. However there was a lot more to whinge about than my wallet. I was tired from Sylvia's restless evening (though not as tired as my friend who came over with her kid who hadn't slept til 1.30am the previous night). Sylvia was unusually grizzly because she had a cold. She wanted to climb on the sofa or verandah and kept falling over. I put her in a new dress on Sunday that seemed huge and when I checked I found it was a size too big despite the size on the hanger being correct. A black hole has opened up in my house where things are mysteriously disappearing - a sock, a shoe and even a half eaten apple. I was mortified when making tea for visitors to find we had no tea bags. However it wasn't all bad. There was a ten dollar note on the table (which is like gold when a wallet goes missing.) The kids loved the gingerbread biscuits that I baked. Sylvia is getting more and more picky about her dinner so I get please when she does eat. She has also loved the rhubarb crumble I recently made. It was even better that it had so little liquid that it stuck to the spoon as she wants to feed herself but still is a bit wobbly with the spoon. And for every time Sylvia cries in frustration, there are so many moments that she makes me laugh with her cheeky giggles and delight at her achievements. Yesterday morning I decided to make pumpkin and bean soup with fennel, inspired by Vicki's recent pumpkin and chickpea soup. I would use less fennel next time (Vicki used much more pumpkin than I) but I loved the flavour. I also added the remaining spinach cheeze sauce to make it creamy and slightly green. I also added the tofu as croutons. 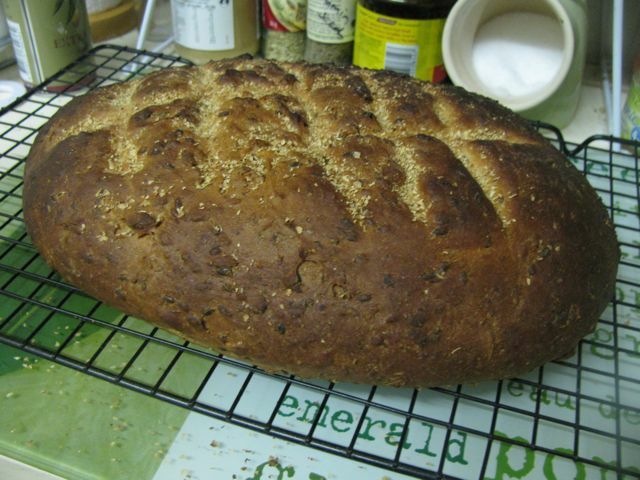 Again I had no-knead bread, this time made by my mum. It was a delicious dinner. A pot of soup on the stove is always a comfort. My days are still going awry so I need soup. Yesterday I got my wallet back - the cash had disappeared but the cards were there. Then I met my mum and we fruitlessly searched for Earl Canteen on Collins Street (which I later discovered is at 500 Bourke St), went to Each Peach which was closed on Tuesdays, and finally sat down at A Minor Place only to find it was so late that we had to rush through lunch. Today I spent a lot of the day at the allergy clinic at the hospital following up Sylvia's emergency department visit a few months back. And I am looking forward to E returning from the UK. Enough whinging. 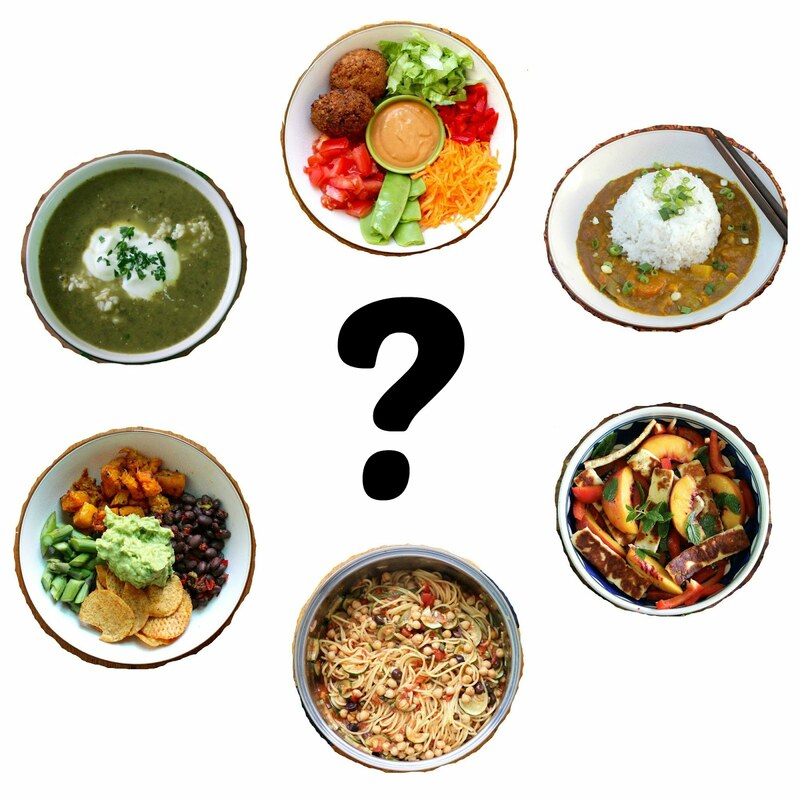 I am sending Ricki and Kim the soup for the Savoury or Sweet Kitchen Challenge. It is vegan and gluten free but after all my trials, I suspect that it wont suit either of their diets but I hope it might provide inspiration for further experimentation. 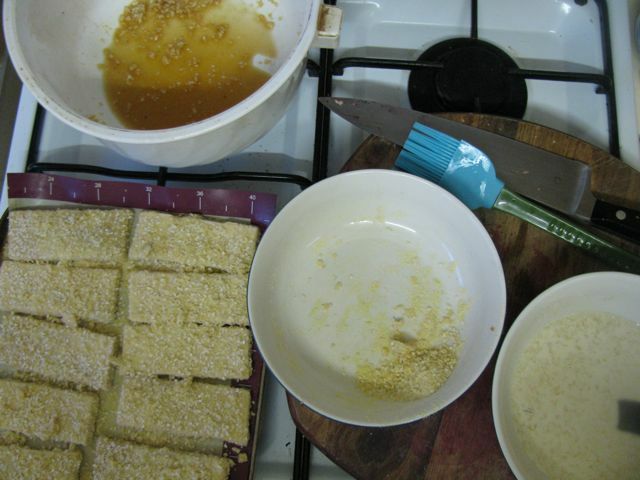 Marinate the tofu in mirin, soy sauce, rice vinegar, sesame oil and garlic for about 1 hour (or more). Mix sesame seeds and maize in a bowl and dip tofu in this (NB I tried it the second time by dipping in soy milk first - I needed more seeds and maize but wondered if it took away from the marinade). 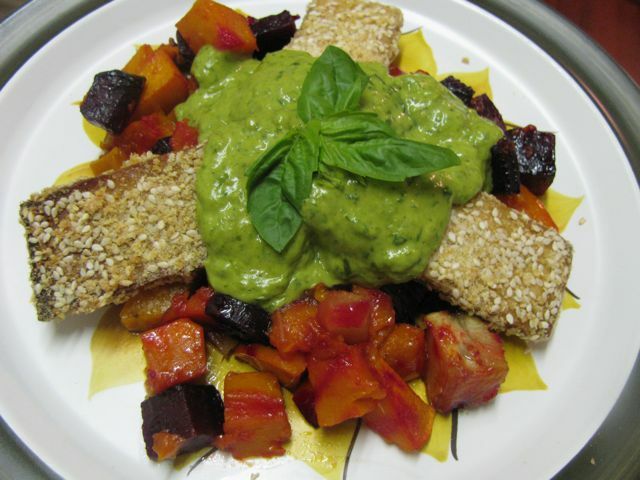 Arrange crumbed tofu on a baking tray and bake at 220 C for 25 minutes, turn and bake for another 15 minutes. Fry onion for 5-10 minutes or until soft and translucent. Add garlic and stir over heat another 2-3 minutes. Cool slightly. Add cashew butter and slowly add milk. Add remaining ingredients (except spinach) and stir till well combined. Add spinach. Blend. 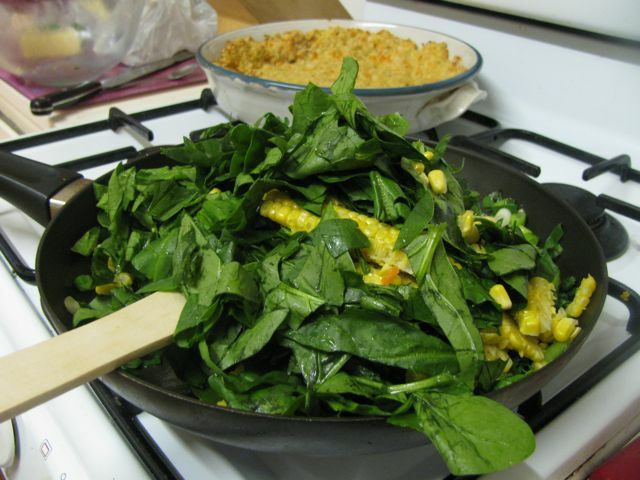 Cook a few minutes so the spinach will cook into the sauce. 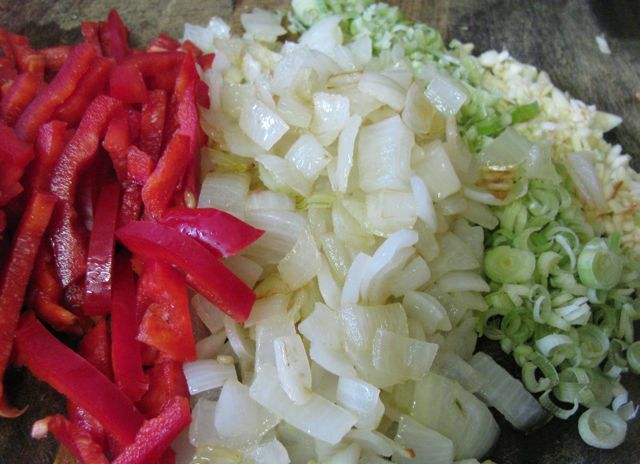 Fry onions in oil in a stockpot until they are browned. 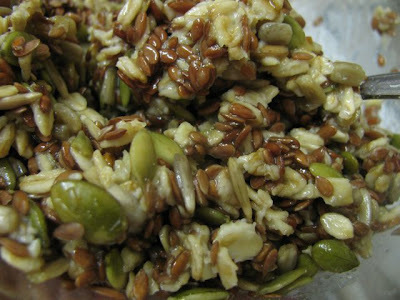 I did mine slightly longer than I would have (maybe about 10-15 minutes) because I couldn’t find the fennel seeds. Add fennel seeds and garlic. Cook another couple of minutes. Add potatoes and beans and simmer for about 10 minutes. Add pumpkin and simmer for about 15 minutes. Add remaining ingredients and simmer for about 10-15 minutes. Blend. I let mine cool and cooked it another 5 or so minutes once it was hot. Serve with crumbed tofu as a garnish. 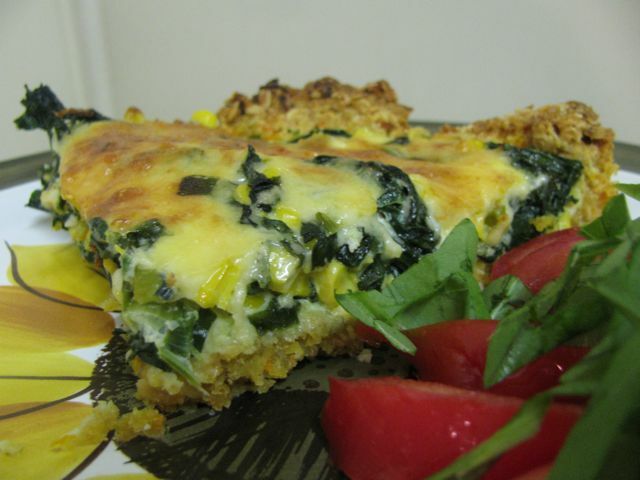 On 14 July 2008, Helen of Food Stories posted a very tempting Rainbow Chard and Parmesan Tart (with a Carrot and Oat Crust). I am always in search of a good tart with an easy crust that is on the healthy end of the tart spectrum. Last month I stumbled across the post that I had saved on my blog reader and made my own version with spinach, corn and spring onions (being the offerings of my fridge) rather than brown onions and chard. Then I decided to check the recipe on Helen’s blog. Imagine my bemusement upon discovering that the tart had disappeared from her blog. It was inconceivable! I had seen it there! It was on my blog reader! But nowhere to be found on Food Stories. Fortunately I decided to delay contacting Helen about this because I was too busy. When I checked the url again today before posting, I found that the recipe is now returned to its rightful place or maybe I was just looking in the wrong place all along. It’s a mystery! When I have more time I will share more mysteries with you – grizzling babies, a lost wallet, and nutritional yeast flakes. But today I merely have time to share this recipe, which is most excellent. E couldn’t praise it enough. Even Sylvia had some. The crust is soft but wholesome and satisfying. 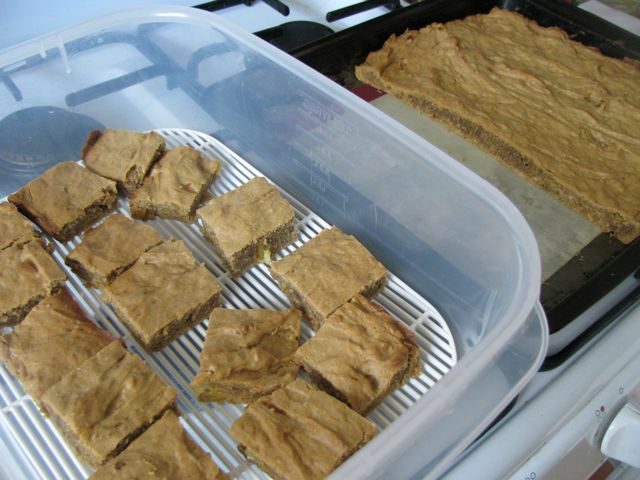 Helen made it when she was experimenting with healthier tarts. 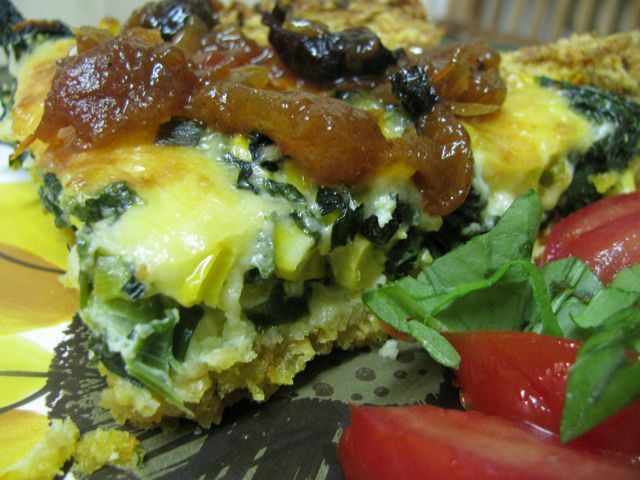 The filling is really just a matter of some egg, milk, cheese and what vegetables are on hand. I especially recommend the tart to those who like me are lucky enough to have a grandmother who makes wonderful tomato chutney and sends some your way. We ate it with aforementioned tomato chutney and a simple tomato and baby spinach salad. A great dinner and wonderful leftovers. Adapted from Food Stories (who adapted crust from Bounteous Bites). Mix the carrots, oats, flour, baking powder and salt. 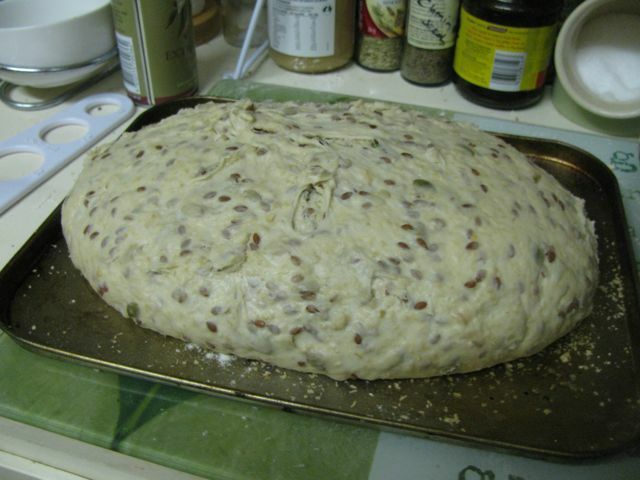 Rub in the butter until the dry ingredients are incorporated and the mixture comes together into a dough. Press into 24cm flan dish. Helen says to chill but I didn’t. Bake for 15-20 minutes (I did 20) at 200 C.
Heat oil in a large frypan and fry the spring onions, garlic and corn kernels for 2-3 minutes. Stir in spinach and fry till wilted. Season. 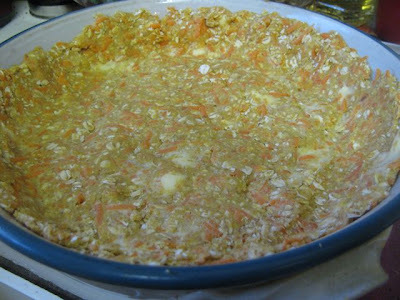 Layer the vegetables, cheese and egg/milk mixture in the tart crust (or I think I would prefer the cheese, then vegetables then egg/milk mixture but E disagreed with me on this). Bake for 20 minutes at 180 C and then for 10 minutes at 220 C or until the top is golden brown. 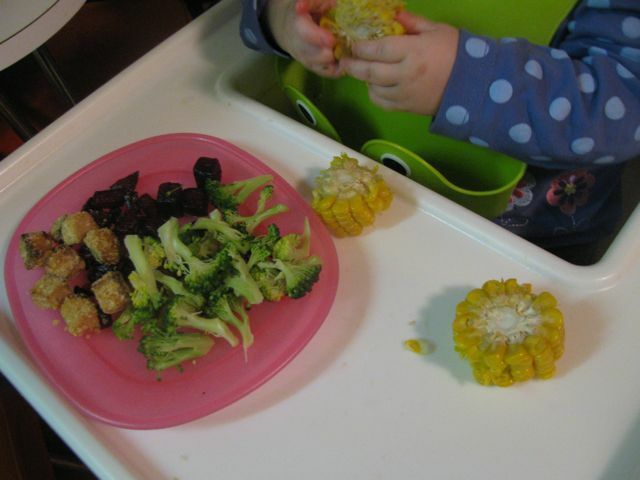 Sit for 5-10 minutes before slicing and serving with a simple salad. It is the weekend. Time to relax, pour yourself a cuppa and join me in some navel-gazing. 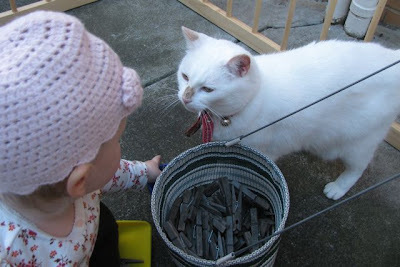 I have had two bloggers – Elle and Cakelaw – who were kind enough to show their appreciation for my blog with awards recently and asked me to share some random things about myself. It seems I am constantly sharing random facts but here we go. 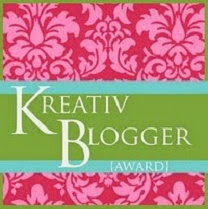 Some time ago Cakelaw, of Laws of the Kitchen gave me three awards: Kreativ Blogger, Honest Scrap and Happy 101. 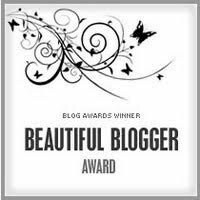 Then more recently Elle of the Bread Bakers Dog (and Feeding my Enthusiasms) gave me the beautiful blog award. 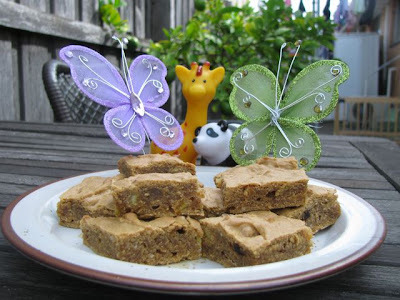 Both Cakelaw and Elle are wonderful bakers and I encourage you to check out their wealth of recipes and ruminations. Both awards came with the instructions to list seven random things about myself and then pass the award onto seven bloggers, let them know etc etc. Time being precious, I have rolled the awards into one for the sake of the meme and passing them on. As I feel like I have shared a lot about myself on this blog, I thought I would give myself a little focus and write seven random creative things about myself. 1. My sister-in-law HH is amazing with her crafting. Her creation that I love most is the cross stitch sampler she made for E and me when we got married, and now hangs in our bedroom. 2. My mum taught me to knit when I was at school and I loved it. When I was a student I knitted myself a few jumpers and was so obsessive about it that I used to knit on the tram on my way to work, before knitting became trendy. I have recently started knitting a scarf for Sylvia but it is slow going. 3. When I was at school, I once latch hooked a cushion cover with a picture of Grover from Sesame Street. I don’t know what happened to my latch hook but I wish I still had it to put tassles on Sylvia’s scarf if I ever finish it. 4. I hate sewing but I love my sewing box that I have had since I was a kid. It has an unfinished tapestry and an unfinished placemat in it, a felt scissors holder I once made, and lots of needles and thread for sewing buttons back on clothes. 5. 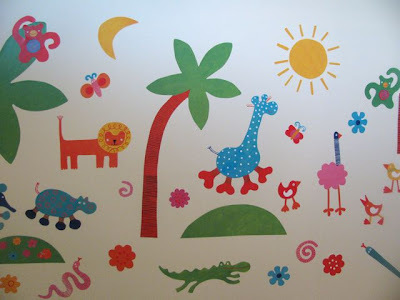 I dream of painting a mural on a wall, preferably with a giraffe in it. Maybe one day. Meanwhile, the closest I get is plastering Ikea stickers on the bathroom wall. 6. When I was a child we always joined up with another family to perform a Christmas play for our parents. When we were young my little brother was often baby Jesus in the nativity scene. As we got older we started writing more complicated plays such as how Christmas was celebrated in different part of the world. 7. As a student I once won (a paltry amount of) money in a poetry competition. However, it was never published in the student newspaper because there was some sort of strike. Astra at Food for Laughter has such a joie de vivre and is always inspiring in the way she adapts recipes to be healthy even when baking the most decadent chocolate creations. Hannah at Wayfaring Chocolate not only makes thoughtful and amusing comments but she also has such a novel angle on food – the chocolate she meets on her travels - I have never read such involved descriptions of chocolate before! Katie at Apple and Spice has lots of appetising food but I am constantly marveling at her cakes. She often inspires me with her wonderful ideas for presentation and her decadent baking. Lisa at Bake Bike Blog is a new blog on my radar but I wanted to mention her here because I just love her idea of her mystery box. She has a box filled with ingredients written on pieces of paper and regularly pulls an ingredient out of the hat to inspire her to try different things. Such a great and creative idea! 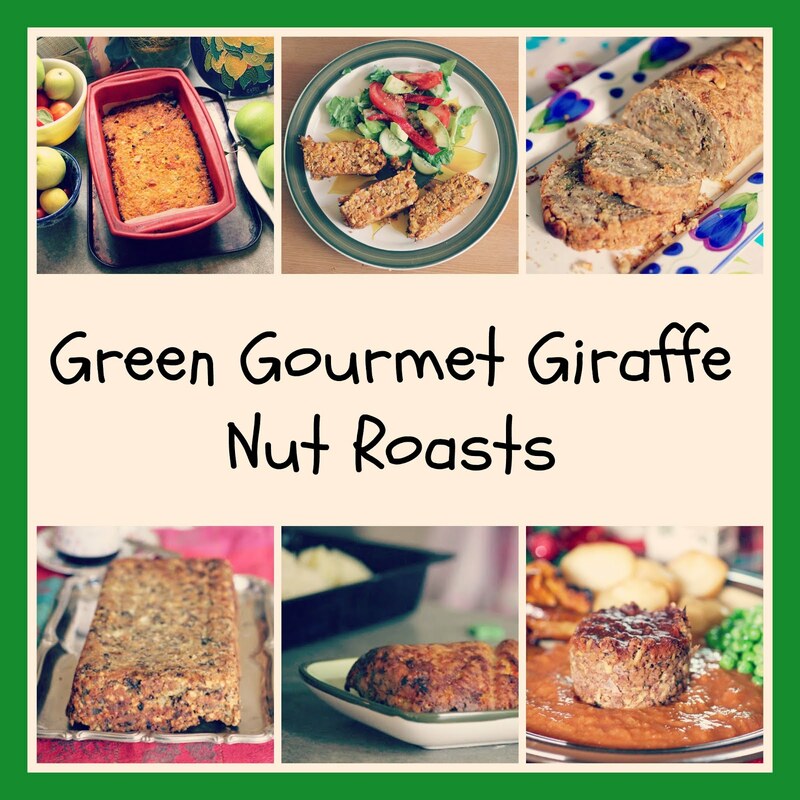 Nic at Nip it in the Bud has a lovely eclectic blog with delicious recipes, gardening, crafting and even a sunflower giraffe. She originally connected with me because we love giraffes and our cats. Wendy at a Wee Bit of Cooking has a gorgeous blog. When I started reading her blog I loved her banner with a giraffe on it but now she has a girl and her dog which is really fitting. Not only does she have wonderful recipes but she posts the most beautiful photographs, mostly of her corner of Scotland. 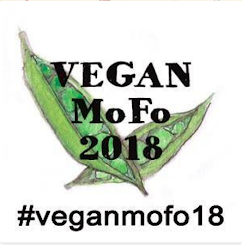 Lastly, it seems an appropriate moment to also let you know that I was included in this list of 100 blogs leading the food revolution.